Learn about the temperament and personality of the Swedish Vallhund. Discover what he's like to live with, his traits and characteristics and how he generally behaves. And look at lots of Swedish Vallhund photos. 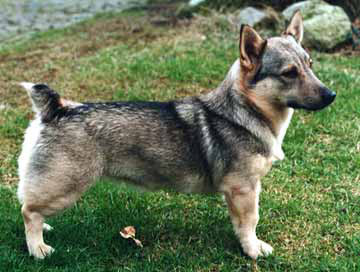 The Swedish Vallhund is an even-tempered and eager-to-please family dog, as well as a vigilant and athletic herding dog. He is a big dog in a small body. He is active, and needs sufficient daily exercise to keep him healthy and happy. He also needs mental stimulation. If he gets bored, he could get destructive. This breed likes to spend time outdoors and does well in obedience, agility, tracking, herding, and flyball. They also serve as therapy dogs and search and rescue dogs. They are really quite versatile. However, they were bred to herd, and they will try to herd just about anything: birds, guests, you, and your children. The Swedish Vallhund is a heeler, which means he herds by nipping at the heels. He could potentially nip at the heels of a child while trying to move her around, and though the dog means no harm, this is still painful for the child. In all other ways, the Swedish Vallhund is gentle and kind. He wants to be included in family activities. He is protective and makes a good watchdog. He is intelligent, very quick to learn and highly trainable. He is a happy dog with an entertaining sense of humor. This breed matures slowly and might not reach their prime till they are four years old. But they can move at lightning speed long before that. These dogs are fearless. The Swedish Vallhund is intelligent and quite easy to train. He learns new commands quickly at an above average rate. The Swedish Vallhund is a very heavy shedder. He sheds an awful lot of hair! You'll find hair all over your home, stuck to everything! You'll probably even find it in the butter!